Rammellzee passed away in 2010, but before he left us he recorded his magnum opus, ‘Cosmic Flush’ with producer Jonah Mociun. Unreleased, eight years have passed. 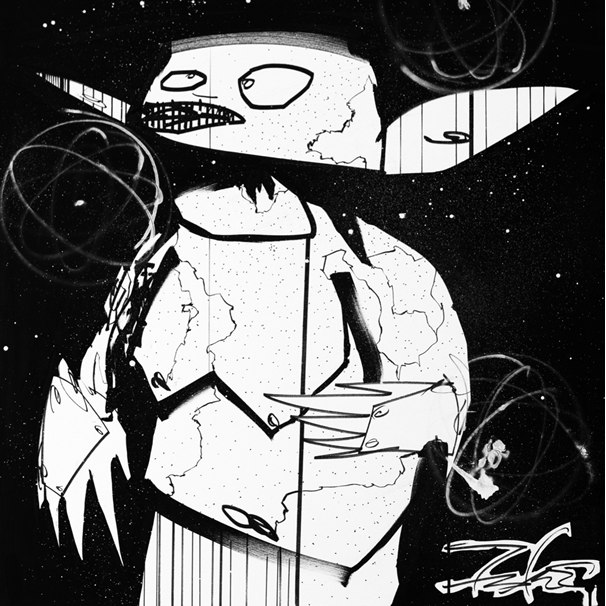 The collection of breakcore and speed metal-influenced rap tracks stand as a futuristic relic which is just now about to see the light of day. Available from the excellent Gamma Proforma, ‘Cosmic Flush’ fully realises Rammellzee’s complex philosophy and unique vision of futuristic hip hop, apocalyptic science fiction, and extreme sonic exploration. To celebrate the life of one of our culture’s great minds Rob Swain of Gamma is proud to present ‘Cosmic Flush’ as a commemorative series of records and prints. There are 7 core tracks, each will be reinterpreted and remixed by a visual and audio artist. We can also look forward to these artworks forming part of an exhibition which will take place in New York & London. 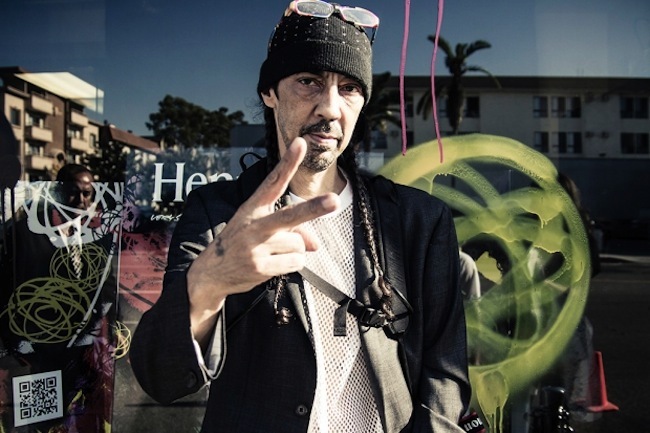 This release is Part 2 in the set, ‘How’s My Girlfriends’ has been visually reinterpreted by the NYC street art legend that is Futura, a contemporary of Rammellzee’s, and remixed by Mr Len (Company Flow/LenCo), a pioneering left filed Dj & producer who cites Rammellzee as a serious influence. All orders include the digital download. Pre-orders access the downloads before the official release date. Please note: This release is limited to a max of 2 copies per customer! This entry was posted in Art, Urban runnings..., Words, Sound & Power and tagged Afro Futurism, Company Flow, Futura, Gamma Proforma, Graff, Hip Hop, NYC, RAMMELLZEE, Street Art. Bookmark the permalink.